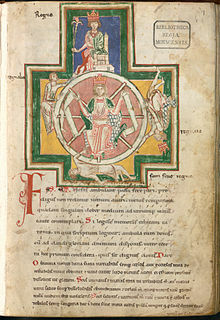 Carmina Burana is the name given to a collection of texts from the 11th and 12th century. There are over 240 texts in the collection, most of them written in Latin, some in Middle High German. Most of the texts are moral or satirical in nature. There are also texts about spring, or about love. Some of them are drinking songs, some of them were used as Minnesang. Some of the songs contain hints for the melodies. For some, the melodies can be reconstructed. The texts were written down around 1230. This happened either in an abbey in Styria, or near Brixen. They were discovered by Johann Christoph von Aretin in Benediktbeuern Abbey in 1803. Today, they are in the Bavarian State Library in Munich. There they can be found there as Codex Buranus, with the signature clm 4660/4660a. Johann Andreas Schmeller edited them and published them as Carmina Burana – Lieder aus Benediktbeuern. Carl Orff took 24 of them as Carmina Burana. He wrote the music for them. The work was first performed in 1937 in the Opera house in Frankfurt am Main. Together with his works Catulli Carmina and Trionfo di Afrodite he made a work containing all three, called Trionfi. Trionfi is performed much less than the Carmina Burana alone, though. Carmina Burana: An Analysis of Perfection, 1996. This page was last changed on 9 March 2015, at 20:08.